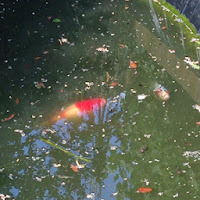 Continuing our look at the Garden and nature, this week we've been exploring our pond and the fish that live in it, we think that there are only 2 left. A couple of winters ago, we lost loads - at least 10 when it froze about 1 foot. We inherited this pond when we moved 5 years ago, the dimensions are approx 7ft x 11ft by 5ft deep. We would never have had a pond so big or deep, but the previous occupants had koi in it. For the past 3 years we've been talking about getting rid of it, but it's going to be such an overwhelming prospect, we've not done it yet. So T always has to be supervised when he's in the back garden and the pond is very neglected. When we moved in there were no fish in it so we went and bought our first 6 goldfish, one of these was 'big bad Barry' our neighbour (and friends) little boy named him a few years ago, back when the hubs and I had never even heard of big bad Barry! Big bag Barry and his un-named sidekick are now the only residents in the pond and appear to thrive in there despite the dirt and filth! Now T watches Ben & Holly's Little Kingdom and is familiar with the big bad Barry episode so he is showing quite an interest in the pond. Rather than try and keep him away, I thought it would be a good idea to let him play near it with me supervising, that way, I'm hoping that the suspense and intrigue will not be so great that he constantly wants to go where he isn't allowed. When talking about the pond and fish, T decided that he needed to catch big bad Barry with a net! 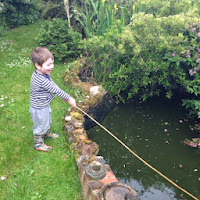 T and I went out armed with nets and a bucket and spent a good hour trying to catch the fish, filling the bucket, scooping up the debris and just generally stirring the water with a bamboo cane (!?!) We had a great time, I tried to find some other pond life but sadly nothing else seems to like these rather bleak conditions as much as our fish do! 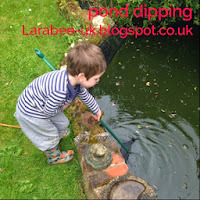 I used to love going pond dipping with my Grandpa, we'd find all sorts of creatures and talk about them, one of my favourite books was an ancient copy of the ladybird pond life book and I'd really love to get a copy for T as I'd definitely like to do this activity again with him.